Škoda Transportation has won a tender to supply 80 trams to the public transport company Rhein-Neckar-Verkehr (RNV). RNV operates public transport in the Rhein-Neckar region including the cities of Mannheim, Ludwigshafen and Heidelberg. Škoda Transportation will supply 80 ForCity Smart trams to Rhein-Neckar-Verkehr. The vehicles will operate in three German federal states: Baden-Württemberg, Hessen and Rheinland-Pfalz on routes in and around Mannheim, Ludwigshafen and Heidelberg. The contract also includes an option for 34 additional vehicles. The contract value is more than 250 million euro. The first vehicles will enter service in early 2021. 12x 6-car trams (approx. 60 m long). The basis for the German LRVs is the ForCity Smart design developed by Skoda’s 100%-owned Transtech plant in Finland. Transtech is currently delivering trams to Finnish capital of Helsinki. 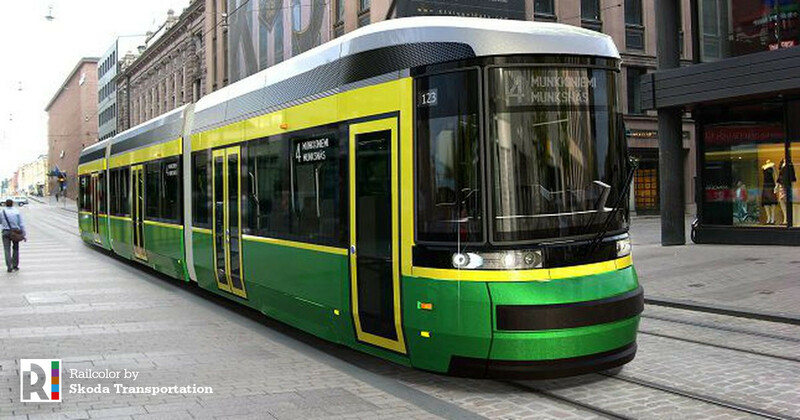 Only last week Helsinki’s public transport operator HKL ordered 10 additional ForCity Smart Artic trams. The delivery to Finnish city of Tampere is about to start. All trams are bi-directional 100% low-floor units, with pivoting bogies, all motorized. RNV’s track gauge is a 1000 mm, just like the Helsinki units. The maximum operating speed will be 80 km/h. The vehicles will also offer a barrier-free access to passengers with reduced mobility. Railcolor: The 60 meter-long 6-car trams will exceed the length (55,91 m) of the 9-car Urbos 100 trams CAF built for Hungarian capital Budapest, currently the longest trams in the world. Most likely the RNV units will lack the “Arctic” element of the Helsinki and Tampere orders, designed for northern conditions that includes thorough thermal insulation.